I woke up on Saturday March 16th, feeling fairly ready to run the Lantau 100. On the one hand, I knew I was lacking in base, having done just 159 km in all of February, certainly one of my lowest months of volume in years. 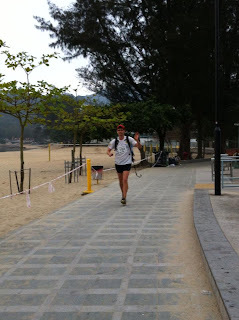 One the other hand, I had had a decent prior two weeks, doing quite a few run commutes, and having done a nice Tai O to Mui Wo run with Kevin, going over Sunset Peak. Thus, it was with a “I can always walk 100K” mind-set that I went to the race. After taking a few pictures with Rhea and Jimmy, and after a wonderfully traditional Dragon dance, the race started. 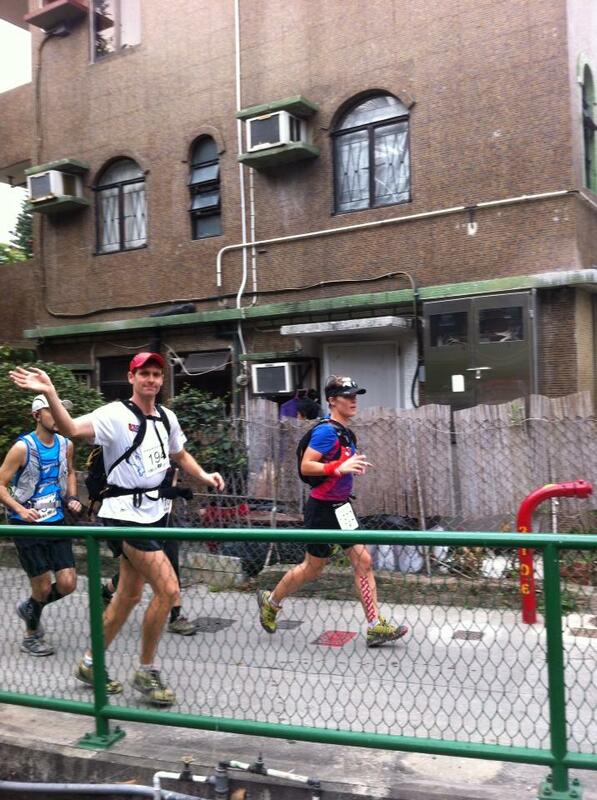 The race went right by my house in Wang Tong (above), and I waved to Rhea and high-fived Jimmy. We then went off on Section 1: up to Tiger’s Head and down towards the DB Reservoir. Going up felt effortless, and I was happy that I ran easy, and didn’t take it out too fast. It was also convenient that this was largely covering a route that I use on a regular basis for my work commutes. One of the first surprises, however, was the way coming down Tiger’s Head, which took a trail off to the right, rather than the one straight down, as I had expected. This trail was technical and steep, as one could imagine. However, in some sections there was no traction on the loose dirt, and I was wearing my old and worn Montrail Rogue Racers, which had limited grip left due to excessive wear. Nonetheless, the trail was enjoyable and we soon got water at the first check point, and started off on Section 2. This section was on “lesser used trails”, going through the thick bushes and briars , and up and down the steep mountainsides on the valley between Tiger’s Head and Pak Mong. These trails were treacherous and steep, with unsure footing. Quite frankly, although I mentally tried to enjoy this section, I’ll admit that these sections are really not my cup of tea. Coming in to the second check point at roughly 2:30 in, I was feeling that my quads were already fading, probably from excessive braking on steep surfaces and my lack of recent prep for this specific terrain. Going up Sunset was nice, and I was careful to run easy. I was enjoying the day and having fun, but I noticed that my body didn’t seem to be performing terribly well, and I was burning through water, as it was fairly hot. Going down from Sunset Peak to the valley in Pak Kung Au, it was clear that my quads were in serious trouble, and I’d have to rely on my poles as crutches. This came to be the story of the race: I was ok on flats and climbs, but a miserable hobbling old man coming down steps and steep ascents. After Pak Kung Au I set off on the next trail and tried to call Rhea, who was planning to meet me at the Big Buddha. Cell phone reception is patchy in the mountains of Lantau, and much of it is covered by China Mobile, rather than HK’s PCCW. Finally, I got though, but had to stand in order to get reception. After the three minute call, I noticed that a bit of pep was back in my legs. I got down to the catchwater feeling ok, and then ran fairly fast, relatively speaking, down the catchwater. My spirits started to pick up, and I thought that perhaps my main rough patch was over. I soon got to the entrance to the Shek Pik Trail. The beautiful forest trails, and views of the Shek Pik reservoir and Big Buddha lifted my spirits, and I arrived at the Ngong Ping aid station feeling good. I soon grabbed a bag Rhea had left for me, filled up with water and food, and headed down to meet Rhea and Jimmy. After that, I ran down the road to the next section, which went around the southwest corner of Lantau, below Tai O. This area has beautiful, grassy rolling hills, and would make one think of perhaps Scotland. In fact, as darkness came over this section, and we inevitably started to use headlamps, I think running on these trails, with the headlamp eliminating the bright white hard dirt surfaces, was my favorite section of the race. In order to boost my mood and stay motivated, I had also strategically planned to start listening to podcasts right around the time the sun went down. Thus, I spent the rest of the race listening to some of my favourite running related podcasts: Dirt Dawg’s rambling Diatribe, Talk Ultra. 100 Mile Ultra Running Podcast, and Endurance Planet’s Ask the Coaches. Finally, I arrived in Tai O. After fuelling up, I left the station, and got a bit lost, losing around 10 minutes. Finally, I started along the right way, but I found that I had become a bit tight, and fast walking was the best I could do. 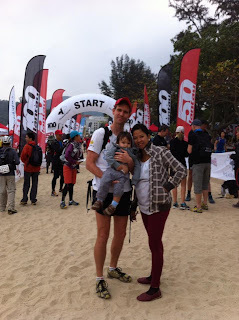 I just tried to get some food in, and prepare for what I believed to be one of the most brutal sections of the race: the way up from the Tai O- Tung Chong path towards Ngong Ping. Sure enough, this trail was another “barely there” trails, going practically straight up through big brushes with sliding dirt underfoot. This is one section where I really regretted that I had worn the rogue Racers (not because they’re a bad shoe, but because almost all the forefoot tread had worn off). Also, it was difficult to use poles in this section because after pushing off from the poles, it was hard to bring them back up in front of the body, due to the thickness of the bushes. Due to my slipping around, I got in a bit of a mental bad state, and started to feel negative, even though I felt ok physically. Eventually I got to the top, and we connect to the Nei Lak trail, which leads over to the Ngong Ping checkpoint. Most of the time, I love doing this little section of trail. When fresh, it probably doesn’t take more than 10-15 minutes, but by this time, I was walking a very runnable section, and I was passed by probably 10 people, which was a bit disheartening. 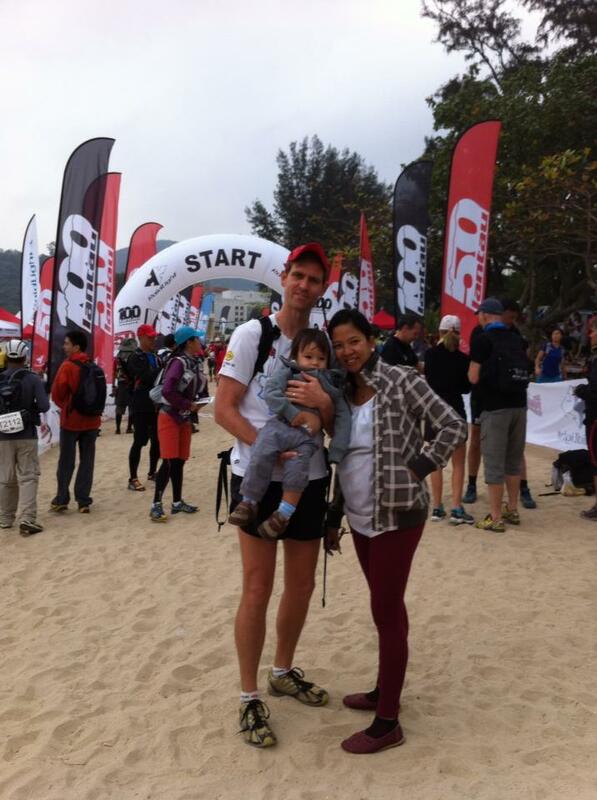 However, I got through the CP quickly and began the assent up Lantau Peak. From the checkpoint to the top took around 45 minutes, and it takes around 30 when fresh, so overall I felt happy with my climbing ability. However, once at the top, it was time to begin a slow near-950 meter descent, which was painful and pathetic, as I hobbled my way first down to Pak Kung Au then along the contour trail. 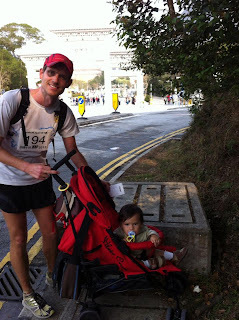 To give some context, in 2012’s 2 Peaks I did the Lantau Peak to Pak Kung Au in 23 minutes, my PR on the countor trail is around 45 minutes. However, I did these two sections in roughly 50 minutes and two hours, respectively. Thus, I was going around 30-50% slower than usual on hills, but probably twice as slow or more on descents. In fact, once at Nam Shan, I was feeling tired and sleepy, and the thought entered my head of just dropping and going home. I kept calculating how much longer the rest of the race might take. I figured it might take 45 minutes to go from Nam Shan to the next CP, antoher 45 mintes to Lo Yan Shan, an hour and a half to do the Chi Ma Wan loop, and another hour and a half home. So close to the finish, and yet another 4 hours left! 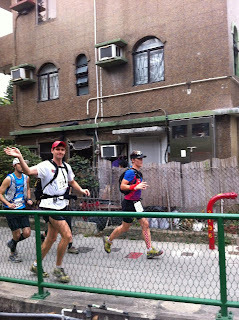 However, after hitting the CP and drinking some coffee, I felt good again, and climbed up Lo Yan Shan fairly fast, and was extremely relived that there wasn’t the 5K Chi Ma Wan loop on the course. By the time I hit the Chi Ma Wan reservoir, the sun was coming up. It was a quick 45 minutes or so back, and I was able to run (ie. plod along) to the finish, where I was met by Rhea and Jimmy! I finished in 22:29, which didn't feel like a very fast time, especially because I walked so much of the race. Nonetheless, it was good enough for 66th out of 181 finishers. I certainly know I can do considerably faster given better training. I used Montrail Rogue Racers. 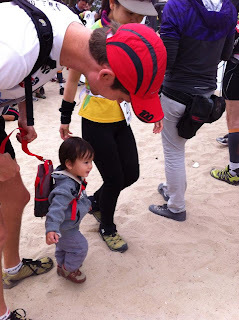 Overall, a wonderful shoe for ultras: light, with good grip, good cushioning, and protection. I normally don’t like running in shoes with more than 4mm drop (RR have 10mm, I believe , but I think that after 5-6 hours into a race, once you get into the “ultra shuffle”, it becomes (arguably) more efficient to heal drop rather than to forefoot/mid-foot land. Thus, I’d strongly recommend these shoes, or some future modification of them. Black Diamond poles. These were a life saver, and saved energy going up hills, but they especially saved me going down hills. Petzl MYO RXP Headlamp. A bit like having a car headlight on the head. As in the past two HK 100, I found a food pattern that works pretty well: a mixture of bread/crackers and oranges as the primary fuel, with some bananas and bars also thrown into the mix. In fact, I probably took two oranges per CP, and ate one an hour. I would open one, eat half, then put the remaining parts in my Brooks shorts, where there are pockets for gels. (Why take nasty gels when one could have a watery, food with sugar and minerals/vitamins in a natural state?). Anyway, the mix of bread/crackers and organs/bananas is very easy to digest, and I never had stomach issues. This is a stunningly beautiful course on some of the most technical trails in Lantau, or all of Hong Kong for that matter. 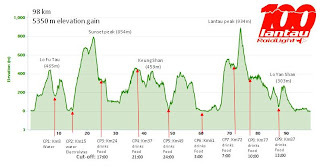 The ascent up to Tiger’s Head, the way up to Sunset Peak from Pak mong, the Shek Pik trail to the Big Buddha and the rolling hills around Tai O are all some of my favorites Personally, I love elevation gain, so this race suited me well. With that said, I’m not a huge fan of the unmaintained trail section, such as in the second section or in the climb up to Ngong Ping, however, I realize that there are people out there who particularly love these parts. I think people would be well advised to do some training on these sections. The race coordination and check points were all very well done, the course was well marked and easy to follow, and the race directors Clement and Sabrina deserve a tremendous respect for pulling off such a good 100k race at the first attempt. Am I satisfied with my own race performance? Quite frankly, I know there is a lot of room for improvement. 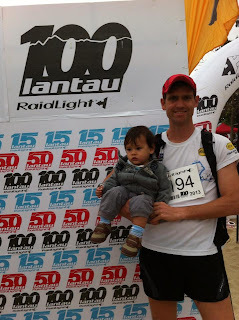 I given 3-4 months of solid training, I could do a 14-16 hour HK 100 and a 17-20 hour Lantau 100. However, I have to also be realistic, and note that this is probably not a possibility for the next year or two, given that a new kid will arrive in June and work is fairly stressful. Nonetheless, I find that ultras are still fun even if one is in 70-80% shape, since there's really no shame in just hiking and enjoying the day. On the other hand, road races are maddeningly frustrating to run when out of shape, since most of the race enjoyment comes from reaching performance goals. Therefore, over the next year or two, I might focus more on trail running and building hill strength, until I find the time to do the training needed to hit other goals.